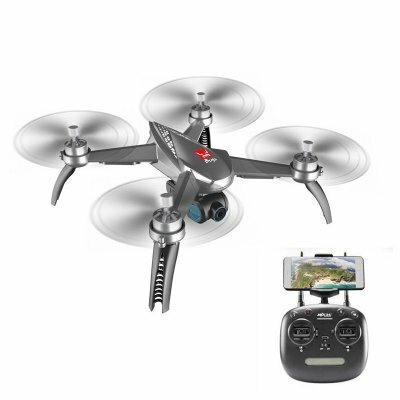 Successfully Added MJX Bugs 5W - Brushless Motors, GPS, 1080P, WiFi Camera, 6 Axis Gyro, APP (Gray) to your Shopping Cart. This MJX Bugs 5W Drone comes with Brushless Motor to ensure low friction during engine operation and reduce heat production. 2.4GHZ Two-way Communication remote control to enhance distance control of the transmitter to 200-300 meters for the ultimate flying experience. High Capacity Battery makes the Fly time up to about 15 minutes on a single charge with the included 1800mAh battery. 6-axis gyro fly system provides a more sensitive of gyro's regulating, more stable and flexible flight. With attractive headless mode, completely solving pilot loss-of-orientation problems. GPS positioning and altitude hold function offer worry-free stable flight. One-key taking off/landing makes the operation more convenient and it is very suitable for novice operation. With the point of interest function, your aircraft will continuously circle clockwise around the preset point. When using Follow Me function, the aircraft's camera will lock on your mobile phone, tracking you automatically and capture your movement with a particular aerial view.